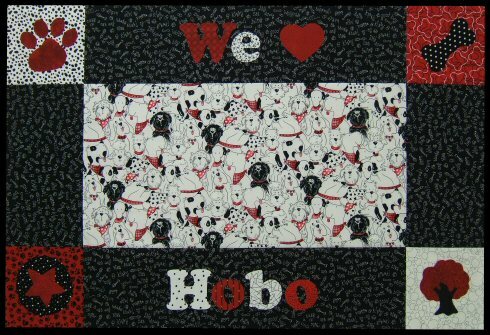 Quilt Size: 24" x 36"
This Pet Mat is a quick fun quilt project that would make a great sleep mat; dining mat or wall hanging for those members of the family, otherwise know as dogs! You can see the Cat Mat version here. ½ yard Dog Novelty Print. 2+ Fat Quarters of Red novelty and tone-on-tone fabrics. 1+ Fat Quarters of Black novelty and tone-on-tone fabrics. 2+ Fat Quarters of White novelty and small print fabrics.